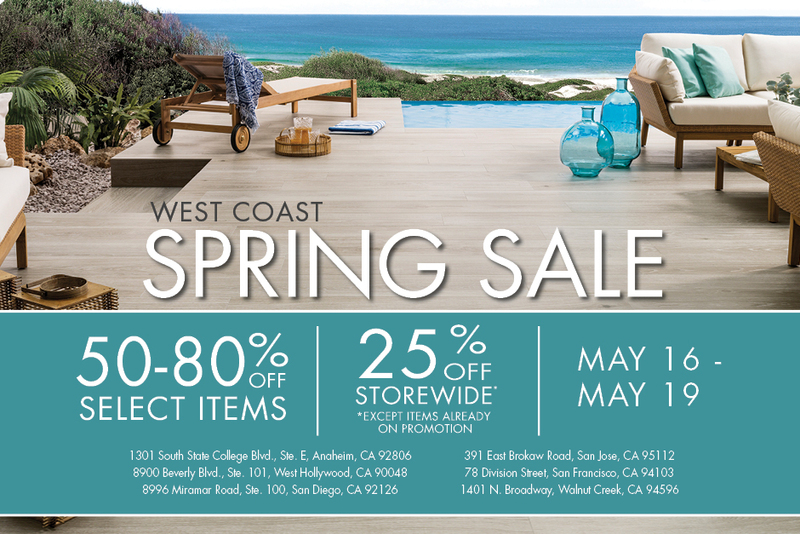 Porcelanosa Walnut Creek, San Francisco, San Jose, West Hollywood, San Diego, and Anaheim showrooms will be running a Spring Promotion Event. Visit the California showroom nearest you to receive 50-80% off Select Items and 25% off Storewide*. *All sales orders paid in full. Discounts applied to items in stock in local warehouse only and ordered from Spain. Excludes tax and delivery charge. Offer does not apply to fabrication services or previous purchases. May not be combined with any other offer. All orders must be will-called or shipped by 5/31/18. This ad must be brought into the Walnut Creek, San Francisco, San Jose, West Hollywood, San Diego, or Anaheim showrooms in order to receive the discount.